Some Enchanted Evening is the most popular song in America after the Rogers & Hammerstein written tune made such a splash in the musical South Pacific when sung by opera star Ezio Pinza who would win a Tony Award for his role in the play. His recorded version reached #7 on the charts but that was only good enough for the fifth most successful rendition this year, as Frank Sinatra went to #6 with his take on it, while Jo Stafford’s rose to #4 and Bing Crosby hit #3. But it was Perry Como who had the definitive record of the song which topped the charts for the entire month of August and may be the most iconic song of his legendary career. 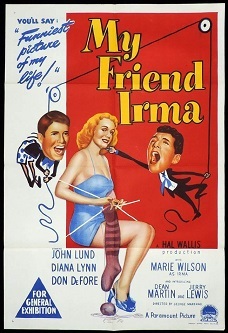 My Friend Irma opens in movie theaters and features the film debut of Dean Martin & Jerry Lewis who were added to the production after filming was already underway with the hopes it’d ease the comedy duo into films without being forced to carry a movie themselves. The duo had been a success in nightclubs since 1946 and in April 1949 they began their own radio show which made their unique brand of humor and song even more popular and were already being pursued by several movie studios before being signed to Paramount. The role Lewis played in the film, that of the annoying Seymour, was added at the last minute and the duo’s yin and yang repartee stole the show leading to 15 highly profitable films over the next seven years before their acrimonious breakup in 1956. Seymour: The least you could do is show me some sympathy, Steve. When you was sick, I was very considerate. Remember when the doctor gave you only 30 days to live? Seymour: Didn’t I go out and get you a calendar? 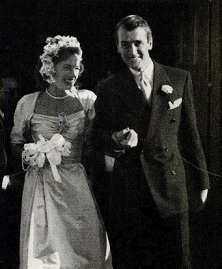 A longer lasting Hollywood union began when actor Jimmy Stewart married Gloria Hartwick McLean on August 9th. Stewart was ten years older than she was and had been a committed bachelor, going so far as to publicly vow that he’d never marry. Yet when he met her soon after turning 40 that quickly changed and he proposed on his 41st birthday. It was Gloria’s second marriage, having two children with Edward McLean before they divorced in early 1948. She’d done some acting and modeling when she was younger and drove an ambulance during World War Two, then after marrying Stewart she committed herself to protecting African wildlife and swayed her big-game hunter husband to the cause as well. Though she largely refrained from the spotlight Stewart’s devotion to her was evident in countless talk show appearances over the years in which he’d tell endearing stories of his wife, and the couple was seen by the nation as the one Hollywood pairing that was as down to earth and unpretentious as anybody’s next door neighbors might be. When she died in 1994 after forty-four years of marriage it marked the end of one of the enduring romances of moviedom. Stewart’s own dying words three years later – “I’m going to be with Gloria now” – were the fitting and predictable coda for the relationship. The National Basketball Association is formed when two rival leagues – the NBL and BAA – merge on August third. Professional basketball had first appeared in 1925 with the American Basketball League the seeds of the NBA however began in 1937 when The National Basketball League was formed as a decidedly unstructured organization with teams playing a loose-knit schedule consisting of whatever games they could manage in smaller arenas of mostly mid-sized towns such as Ft. Wayne, Indiana and the booming metropolises of Oshkosh and Sheboygan, Wisconsin. The rules of the game itself weren’t even uniform, as teams got to choose they played four ten minute quarters or three fifteen minute periods. By 1940 they’d become more organized, at least formalizing a set schedule and expanding the league with addition of numerous teams and integrating the sport starting in 1942. 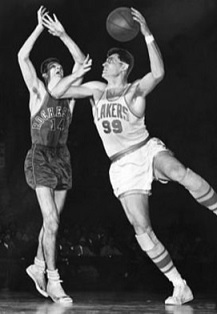 In 1946 competition arrived in the form of the Basketball Association Of America which was focused primarily on the East Coast and began paying higher salaries which resulted in more top players choosing it as well as entire franchises such as the Minneapolis Lakers jumping to the BAA which brought the most dominant player in the world, George Mikan, into the league and signaled the end of any chance the NBL had to compete. As a result the two leagues joined forces and since the BAA was the more powerful organization its president Maurice Polodoff was elected as Commissioner of the new NBA. The 17 team league consisted of the ten established BAA clubs along with the six surviving NBL teams and one new team in Indianapolis. It faced a rough initial decade however with franchises folding at an alarming rate and featuring a slow, plodding style of basketball. By the mid-1950’s long overdue changes to the rules, including the establishment of the 24 second shot clock to speed the game up and boost scoring and a limit on the number of fouls that could be committed, and the addition an increasing number of black stars who played a more exciting and athletic brand of basketball revolutionized the sport. 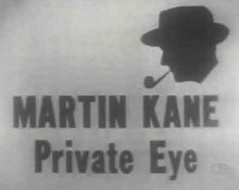 The first of the small screen private detective shows gets its start, not on television but on radio, as Martin Kane, Private Eye makes its debut on August 7th. The television version has to wait until September 1st when the fall season starts, but they were produced in tandem by U.S Tobacco which used ample product placement with both formats to hawk its deadly products. The show initially starred William Gargan as Martin Kane, a pipe smoking private investigator with a tongue-in-cheek style he developed to mask the holes in plotting and character development. The televised version, especially early on, was afflicted with the same problems all live telecasts suffered through – blown cues, flubbed lines and bad camera work, but in spite of this it was just as successful as its radio counterpart, hitting #12 in the TV ratings in its second year and spawning a short-lived comic book of the character. By the third season Gargan dropped out and was replaced by Lloyd Nolan whose interpretation of the character made room for more wisecracks. The next year Lee Tracy took over the title role before Mark Stevens closed out the show’s run in 1953-1954, all of which were a ratings success in spite of the turnover in lead actors. A less successful syndicated version was made a few years later with Gargan back in the role he originated by which time the model they’d come up was about to be modified and perfected by series such as Peter Gunn and 77 Sunset Strip. But Kane beat them all to it. Too much time spent in the sun this summer? You’re not alone and if you’re one of those unfortunate ones who nature didn’t see fit to make highly melanated that means you’re prone to sunburning. But fear not, though we can’t fix your regrettable lack of pigmentation Ammons Antiseptic Powder can help to sooth the pain of your terrible affliction. Sprinkle this magic powder on your body before dressing and it will provide “cushion comfort” that keeps your clothing from rubbing on and irritating your tender skin. 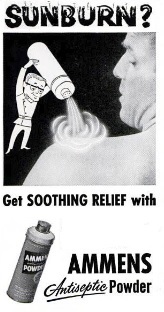 Let it relieve itching, burning, chafing and soreness… at least until the next time you plop your pasty white body on the beach for eight hours and die of sunstroke. Father Knows Best debuts on radio, a full five years before it makes the transition to television. The original radio incarnation was decidedly different from the more famous TV version which would go down in history as the epitome of the idyllic middle-class 1950’s household that television was enamored with in those days. But radio, with its need for rapid fire laughs, had Robert Young, as head of the household, Jim Anderson, presented as a fairly dim character who was much more sarcastic and even demeaning towards his family at times with wisecracks at their expense, while the three kids were one dimensional with each of their dominant personas written primarily for the purpose of delivering ready-made jokes. The radio show was a success however and lasted until the spring of 1954 after which Young embarked on his television career with the same show which began that fall. It featured an entirely new cast and re-wrote his character as a thoughtful, intelligent and compassionate father to emphasize a more wholesome family life. It’s another sweltering summer with the mercury rising all across America as Cleveland checks in at 96 degrees, New York City records temperatures of 99 degrees while Boston tops them all by hitting 101 degrees in a year in which they set a city record with five heatwaves (three consecutive days of 90 degree temperatures). 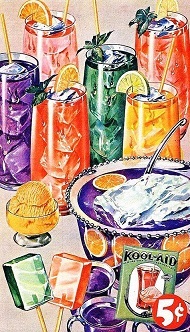 Luckily there’s a way to beat the summer heat with a packet of of Kool-Aid, which will make ten drinks and sells for only a nickle. That’s a lot of cool, colorful refreshment for just five cents.